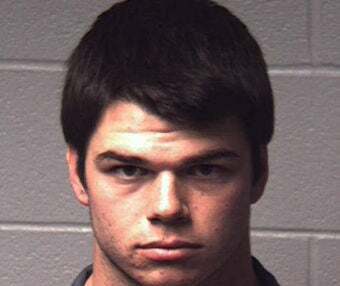 Seven members of the Lehigh University football team have been charged with various things ranging from trespass to assault, after police say they broke into an off-campus house and pummeled one resident in an attempted revenge attack for an earlier assault on one player’s fraternity president. It would have been bad enough if the players hadn’t chosen the wrong house, and beaten up a person who had nothing to do with it. The alleged attack took place Nov. 8, and police said it was led by junior DB Brian Githens (pictured). According to court records, Githens admitted that he and a handful of teammates entered the home around 3 a.m., punched holes in walls, kicked down bedroom doors, and repeatedly punched a sleeping resident, sending him to the hospital. Police have said Githens punched Samuel Hernandez several times in the face, causing a concussion and “busted lip.” Githens admitted he broke into the home in retribution for an assault of his fraternity president, but admitted he had gone to the wrong home and attacked the wrong person, according to police. Githens was charged last month with felony burglary, as well as simple assault and criminal mischief. Yesterday, six other players for the FCS Mountain Hawks were arraigned, all on felony counts of criminal trespass. Police said four of them admitted to entering the home, though all claim that only Githens took part in the assault on Hernandez. At least one player also urinated in the victims’ fridge, according to court records. The players’ preliminary hearing is scheduled for Dec. 30.